A superb fix-it plug-in and creative sound design tool that'll have you tightening in no time. Synths are great for doing much more than simply designing core timbres for our production work. They allow the shaping of sounds so that we can control how they perform over time, with envelopes letting us take the edge off mix elements which are too spiky, or add sustain to sounds we'd like to hear stick around a little longer. Transient 'shapers' of this kind are less readily available as effects' plug-ins, but often control of this type is exactly what you are looking for and actually need. What if the perfect sounding snare is a touch too short, for instance? 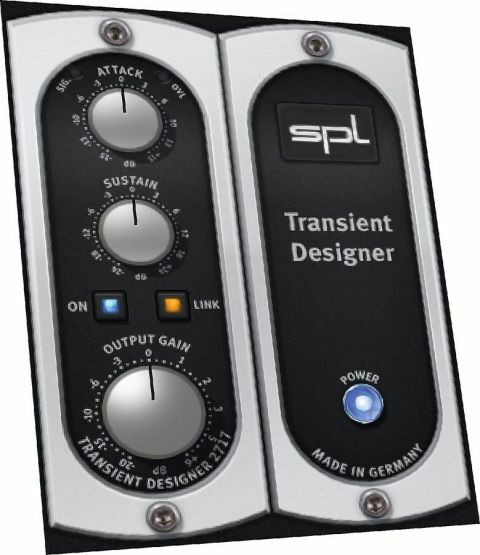 Enter UAD's collaboration with German sound pioneers SPL: the Transient Designer. Graphically, there's not a huge amount to describe. The two main sound-design controls are the Attack and Sustain dials, which allow you to sharpen or soften the relevant volume 'stage' of the sound. Accordingly, the Attack dial, if set to a positive value, places greater volume emphasis on the start of a percussive note, so that the volume increases at this point, producing a 'spikier' result. If it's set to a negative, Attack inverts, so that sharp note starts to become softer, with a tiny 'fade-in' taking the place of the initial peak. It's also possible to soften the start of percussive program material, either in the form of drum hits, bass notes, plucked strings or picked guitars. The Sustain dial does something similar for the second stage of any note, allowing you to increase or decrease the volume of an audio ﬁle once it's come through the Attack stage. It's possible to increase the 'length' of individual notes here, as you can with some dedicated plug-ins such as Logic's Enverb. But rather than using an additional process, such as reverb, to add length and shape to a note, it's all done with the original source sound. Similarly, if you're working with audio material with too much inherent reverb or recorded room noise, you can leave the initial attack alone, while dialling out some of the sustain portion, leaving you with a cleaner, drier result. Attack allows for up to 15dB of gain increase or decrease, while Sustain lets you tweak levels by 24dB in either direction. Helpfully, a master output knob is provided to let you compare your newly re-worked audio ﬁle to the original. In use, it's amazing to discover that two dials can have such a devastating effect, with no end of possible musical applications. Hip-Hop producers, for example, will love the ability to add length and strength to individual drum hits. Similarly, those working with guitarists will be delighted to discover that picked parts can be tamed, with 'negative' Attack times reducing overzealous performances. Sound designers who work to picture can use this tool to shape or trim a sound effect to match a speciﬁc visual cue, and music producers will, no doubt, turn to this plug-in time and time again to offer something new to their sound. What I like so much here is the ability to use the Transient Designer both as a ﬁx-it solution and as a creative tool. Transient Designer proves, once again, that appearances can often be quite deceptive.